I see the region as one with tremendous potential for entrepreneurs. However, I believe that we need more people who can help fund a new business– either angel investors, venture capitalists or traditional banks that can lend. List three words that describe an entrepreneur. For me, an entrepreneur is someone who is passionate, visionary and a risk-taker. Synechron has always focused on providing solutions to our clients’ toughest technology challenges. We receive constant positive client feedback– this reaffirms that Synechron, indeed, delivers. This feedback, that Synechron adds tremendous value to our clients, is the biggest motivator for me. Who do you think are great examples of entrepreneurs in the MENA region and abroad? Dr. Maryam Matar, Founder of the UAE Genetic Diseases Association, is one entrepreneur who I really admire. Her social development strategies are inspiring. Sue Riddlestone and Pooran Desai, Founders of BioRegional Development Group, have impressed me with the kind of work they are doing. Their concept of an eco-village, executed in London, is impressive both in terms of the foresight (or attitude) as well as execution. What made you decide to pursue business endeavors in the Middle East? How do you feel that you best reach your target market? The GCC region has always been on my radar and I am extremely delighted that we finally started operations here in mid 2008. For Synechron, this has been a strategic expansion as enables us to offer our clients in this region turn-key and onsite consulting services as well as the ability to leverage our base of high-end, skilled resources and 24/7 global delivery capabilities. We have the expertise to deliver customized solutions and services around major branded financial software and technology products. Since the start of our operations, we have established our presence with clients in the Middle East region in our core verticals. What moment in your career was the most discouraging? How did you overcome it? Synechron, from the very beginning, has been competing with global IT firms. There were times in the early days when a client firm chose to go with a bigger and more established firm rather than take a risk with a new startup that we once were. But then our passion, backed by our vision to be more than merely a provider of manpower services, saw us through even the most trying times. What moment in your career did you feel that you’d finally “made it”? Looking back, this wonderful journey of driving Synechron -from a single-room office to where it is today with over 5000 trained employees working across 12 countries- has been my greatest achievement. We started with a handful of clients and have been fortunate enough to keep finding additional clients who showed tremendous trust in our ability to deliver. We have over 110 active clients today. Synechron has a revenue run rate of US$250 Million with a compounded annual growth rate (CAGR) north of 25%. The fact that Synechron is able to achieve this milestone on its own steam (without any capital funding or bank debt), is definitely a satisfying achievement. In my view, it is imperative for an entrepreneur to be a risk-taker. Take our case for example: My friends and Synechron Co-Founders Zia Bhutta and Tanveer Saulat and I quit our highly rewarding jobs at leading U.S. financial institutions to set up Synechron. Our aim was to be strategic solutions partners offering high-end technology capabilities and deep domain understanding, rather than merely proving manpower services. We started operations with a seed capital of INR eight lakh, at a time when the industry was poised for a slowdown and losses. The risk paid off for us. In my opinion, it is important for an entrepreneur to understand the concept of calculated risk-taking. This involves having a clear vision of your direction and goals, among other things. How has Synechron continued to grow with no cash injections from outside investors? Since the time Synechron’s foundation stone was laid, we made a conscious decision to be a self-funded firm. 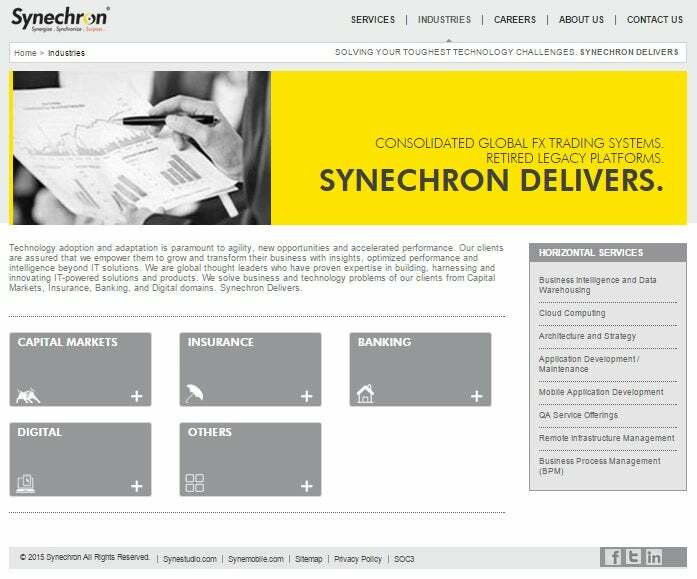 I have always aimed at making Synechron a ‘Best in Class’ player focused on exceeding client expectations. We’ve maintained our focus on delivering and adding value to our clients’ businesses, as opposed to chasing financial metrics. It is my belief, that being judged as the “Benchmark“ in a particular domain, matters more than being judged merely on numbers. At Synechron we encourage innovation. We invest significant time and effort in understanding and addressing the business challenges of our clients. We have always focused on the fulfillment of our client’s business interests, and our customer-centric approach has nurtured long-lasting relationships, which have given us the financial stability to move forward and grow. How has your company contributed to the overall growth of the UAE? Synechron provides a more holistic range of services to its existing and new clientele, thereby serving as a fulcrum for growth and development in the UAE region. The Gulf markets have shown strong indications of stability and growth. This consolidates my belief that our presence here, backed by our domain capabilities and proven world-class delivery services, would contribute to the significant growth of the region.